Renovo Partners’ approach to the Insurance and Financial Services marketplace is to leverage our unique expertise, insights and talents to help our clients drive results and implement strategies. Our focus is to enable your business to fully realize your growth and profitability potential. The Renovo team utilizes our diverse background of successful exclusive and independent agencies, as well as extensive field and corporate knowledge to address any client need. We bring the learnings and best practices of two nationally recognized agency principals that have successfully continued to grow their businesses, expand their footprint, and establish themselves as leaders in the industry. This is coupled with the knowledge and savvy of two insurance executives with extensive experience in corporate underwriting, claims, finance, sales, marketing, strategy and governance. This blend of expertise allows us to deliver actionable solutions that are relevant and unique to your specific business setting and aspirations. Finally, we deliver this through a “Rolling up the Sleeves” consulting approach that provides relevant solutions, tools, and programs to our clients. Our Portfolio of Insurance and Small Business Distribution Services Gets Results! Our Portfolio of Insurance and Small Business Distribution Services Gets Results! 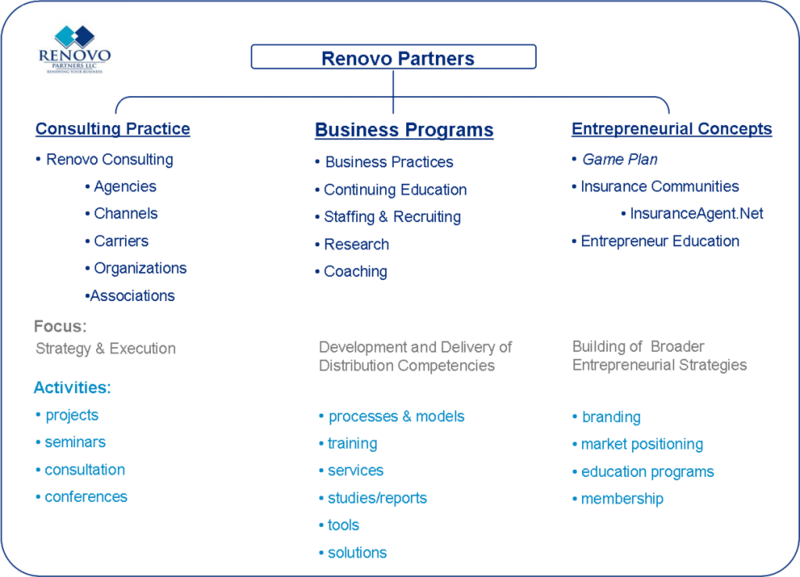 We understand the challenge of defining and executing your business strategy. At Renovo, we have developed multiple approaches to help you take the next step in taking control of your business. Our consulting team is poised to deliver solutions at the agency, market and channel levels. We challenge clients to aim high. At Renovo, we have developed proven programs that address the unique challenges and opportunities faced when creating, growing and maintain distribution excellence. These programs are designed to seamlessly complement your business strategy and are adaptable to any small business & insurance sales/distribution scenario. We know it takes more than just implementing some new tools or attending a seminar to be truly successful. It takes the proper motivation, focus and entrepreneurial spirit. Our programs, consulting, research and tools have been proven within the insurance and financial services industries, but apply to anyone with the right business spirit. To revive, renew, restore, repair and repeat. Renovo will be regarded as the leading North American provider of business consulting services to the insurance and small business market place. Renovo’s mission is to provide advice, motivation, and training that maximizes growth and profit. 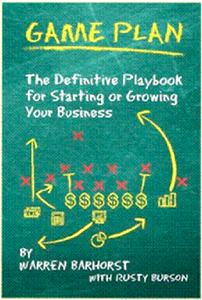 Click on the image below to find out more about the definitive playbook for starting or growing your business. Copyright © 2019 Renovo Partners.